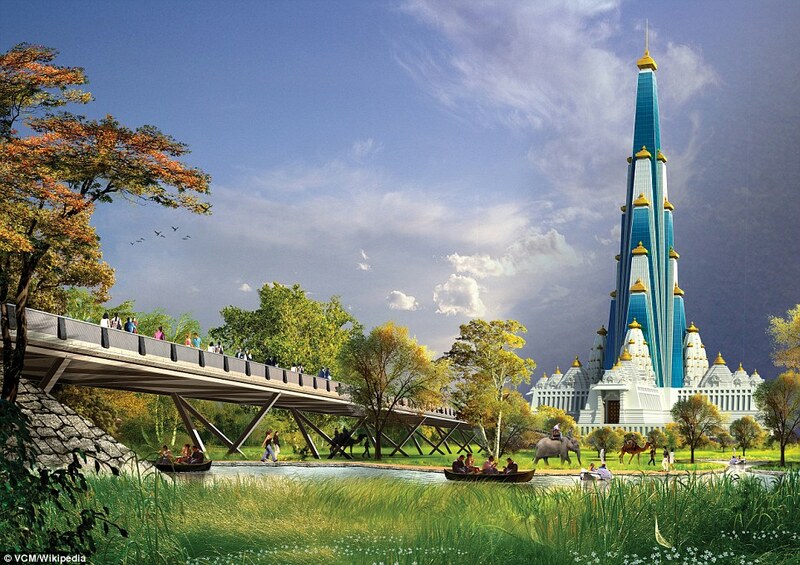 With its indoor theme park and helipad, this building might seem more like it would belong in Las Vegas, but this towering Hindu temple is set to become the world's tallest religious skyscraper. 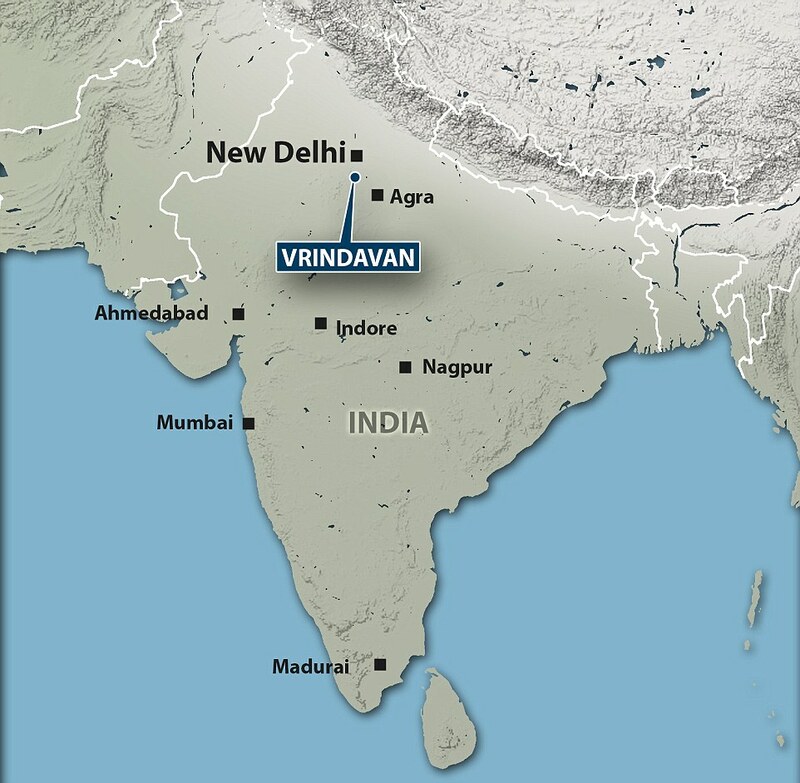 The Vrindavan Chandrodaya Mandir, which is currently under construction at Vrindavan in the Uttar Pradesh region, will stand at 700 feet (210 metres) tall and will have 70 floors. The building, due for completion in 2022, has been dedicated to Hindu deity Lord Sri Krishna and designed to blend traditional Indian 'Nagra' temple architecture with modern aesthetics. Visitors will be able to ride to the viewing deck at the top of the building, with an immersive 3D light and sound show planned for the journey up. 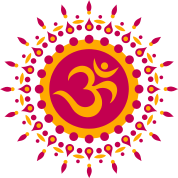 The ride will take people through the planetary systems of the universe, as described in the Vedic literature, the oldest scriptures of Hinduism. 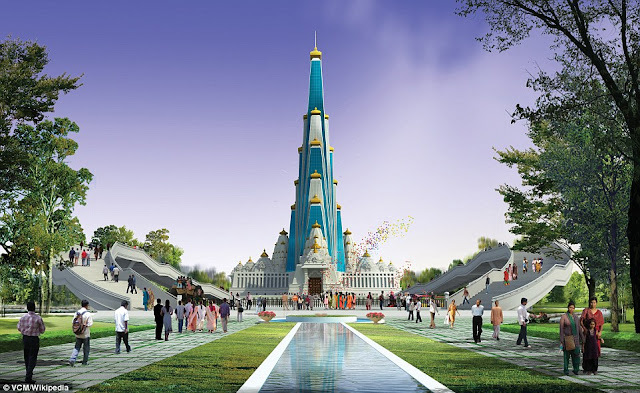 At 700 feet (210 metres), the temple will be taller than India's Taj Mahal, which stands at 239 feet (73m) tall, as well as St Peter's Basilica in the Vatican, which measures 422 feet (128.6m). Work first began on the building, which also includes a 1,000-seat auditorium, Center for Krishna Heritage Studies and a food court, in 2014. Dedicated to Hindu deity Lord Sri Krishna, the striking structure has been designed to blend traditional Indian 'Nagra' temple architecture with modern aesthetics. It is the work of Indian architecture firm InGenious Studio and engineering consultants Thornton Tomasetti. ‘Attractions planned in the theme park would be like park rides, animatronics, light, sound and special effects, as well as the Vraja Mandal parikrama, shows and laser shows,’ said Narasimha Das, project director of the temple. 'The temple is planned to be a vibrant platform for reviving the lost glories of our rich heritage through festivals, cultural and social activities throughout the year,' says a statement on the architecture firm's website. Set to open in 2022, the building is surrounded by 30 acres of forest, designed to recreate the natural forests of the Braj region. 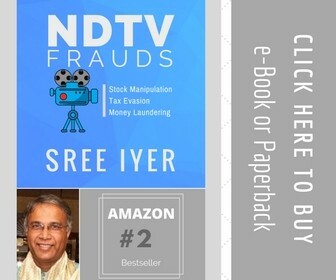 'A look-alike of the verdant forests of Vrindavan will be recreated around this magnificent temple with varieties of lush vegetation, green pastures, elegant vistas of fruit bearing trees, flower-laden creepers serenaded by bird songs, clear water lakes with lotuses and lilies and waterfalls that tumble from small artificial hillocks - all recreated from descriptions in the Srimad Bhagavatam and other source books of Lord Sri Krishna - to transport the visitors to Krishna's times in Vrindavan,' says the design firm's website. 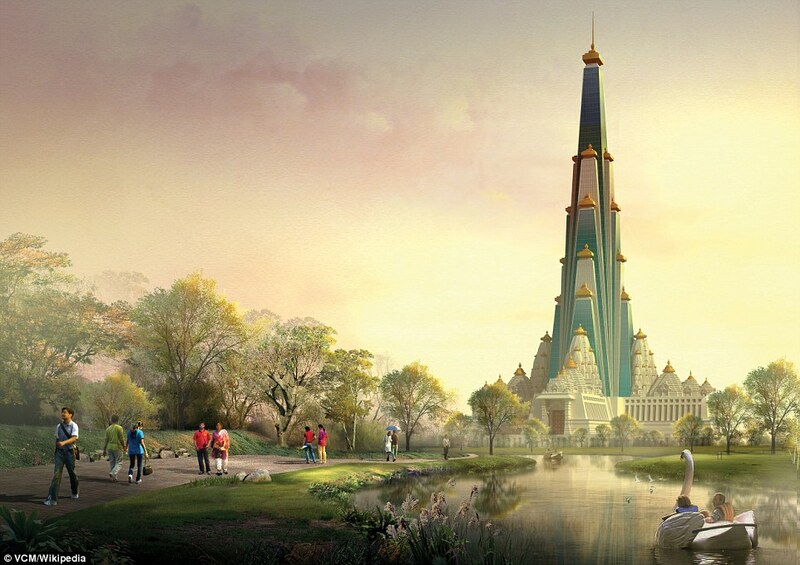 As well as a temple, the 70-storey building will include guest houses and restaurants. Religious activities and festivals are set to take place at the massive temple throughout the year, on its completion. The tiered building has been designed to be earthquake-proof and will be built on foundations 16 feet (five metres) deeper than those of Dubai's Burj Khalifa - the world's tallest structure. 'The foundation of the Burj Khalifa is 50 metres [165 feet]. 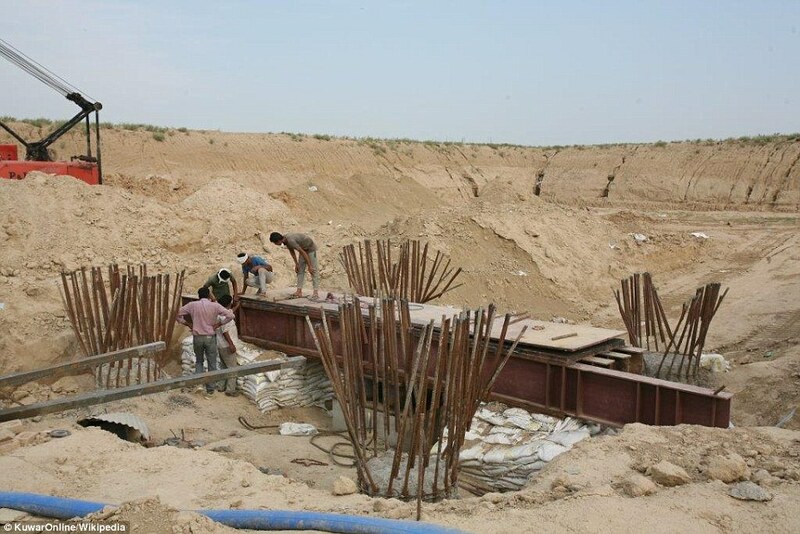 The temple's foundation is 55-metre [180-foot] deep. The foundation will have 511 columns, which will be completed by March next year,' said Narasimha Das, senior Vice-President and project director of the temple, reports. The base of the build will be constructed in the shape of a plus sign, with one of four temples on each point. The project is said to cost around $45 million (£36 million). The sale of guest houses at the site will provide a portion of the funds, as will donations by devotees. When finished, the entire site will cover 62 acres (250,905 square metres) of land. The temple will also be involved in a number of social programs including a free lunch initiative for economically challenged children in the surrounding area. A number of restorations will also be carried out on nearby sites related to the Lord Sri Krishna who is believed to have come from the area, according to scripture.